The natives of the St. Ignace region were migratory. In the spring, the Anishinabeg gathered maple sugar and fished sturgeon and smelt. Summer found them in settlements surrounded by crops of corn, potatoes and squash, and near the abundant supplies of wildlife, fish and berries. They developed efficient housing, watercraft, hunting and farming tools. The heritage of the Straits evolved and changed over the centuries beginning with the arrival of Roman Catholic missionaries and then French and British explorers and fur traders … The natural waterway joining Lakes Michigan and Huron at the Straits of Mackinac generated extensive water traffic, and prompted the establishment of an outpost during the period of French occupation. The outpost – Fort de Buade – became the seat of King Louis XIV’s authority in the interior of North America. French notables including Rene-Robert Cavalier, Sieur de La Salle and Antoine Lamothe Cadillac spent time at the post. St. Ignace was among the largest settlements in New France from the last decade of the 15th century until the establishment of Detroit in 1701. The British arrived in the St. Ignace region with the defeat of the French during Seven Years War. St. Ignace played a pivotal role in the fur trade until this industry began to wane. By the mid-1800’s the financial importance of commercial fishing to the economic well-being of the area eclipsed that of the fur trade. Ancillary industries including curing, packing and shipping augmented the fishery. It was during this period that the Mackinaw Boat became a familiar sight on the waters in and around the Straits. As the lumber industry in Michigan evolved, St. Ignace became a center for mill yards and its proximity to the shipping lanes added to its importance as a commercial hub in the northern Great Lakes area. Read on for more including travel information. Sheldon took this photo back in July of 2012 at sunrise. View it bigger and see more in his Michigan slideshow. More from St. Ignace on Michigan in Pictures. Doesn’t look like we’ll get an ice bridge for snowmobiles to Mackinac Island this winter. Click to view the photo bigger and follow him on Facebook and at National Photography Workshops. More ice on Michigan in Pictures. A calm night on the Straits of Mackinac, and Michigan’s signature bridge was looking fine! The five-mile stretch of water separating Michigan’s two peninsulas, the result of glacial action some twelve thousand years ago, has long served as a major barrier to the movement of people and goods. The three railroads that reached the Straits of Mackinac in the early 1880s, the Michigan Central and the Grand Rapids & Indiana Railway from the south, and the Detroit, Mackinac and Marquette from the north, jointly established the Mackinac Transportation Company in 1881 to operate a railroad car ferry service across the straits. The railroads and their shipping lines developed Mackinac Island into a major vacation destination in the 1880s. Improved highways along the eastern shores of Michigan’s lower peninsula brought increased automobile traffic to the straits region starting in the 1910s. The state of Michigan initiated an automobile ferry service between St. Ignace and Mackinaw City in 1923 and eventually operated eight ferry boats. In peak travel periods, particularly during deer season, five mile backups and delays of four hours or longer became common at the state docks at Mackinaw City and St. Ignace. With increased public pressure to break this bottleneck, the Michigan legislature established a Mackinac Straits Bridge Authority in 1934, with the power to issue bonds for bridge construction. The bridge authority supported a proposal first developed in 1921 by Charles Evan Fowler, the bridge engineer who had previously promoted a Detroit-Windsor bridge. Fowler’s plans called for an island-hopping route from the city of Cheboygan to Bois Blanc, Round, and Mackinac islands, thence to St. Ignace, along a twenty-four-mile route. The Public Works Administration flatly rejected a request for loans and grants to implement this project. A plan was then drawn up for a direct crossing from Mackinaw City to St. Ignace, but they were again denied funds. In 1940, a plan was submitted for a suspension bridge with a main span of 4600 feet. This design was a larger version of the ill-fated Tacoma Narrows Bridge in Washington State, a structure destroyed by high winds on November 7, 1940. Although the disaster delayed any further action, the activities of 1938-1940 nevertheless produced some important results. 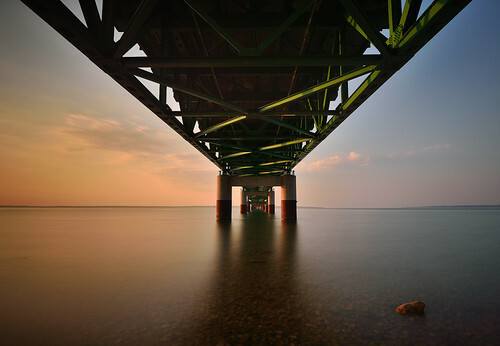 The bridge authority conducted a series of soundings and borings across the straits and built a causeway extending out 4200 feet from the St. Ignace shore. The Second World War ended any additional work, and the Legislature abolished the bridge authority in 1947. William Stewart Woodfill, president of the Grand Hotel on Mackinac Island, almost singlehandedly resuscitated the dream of a bridge across the Straits of Mackinac. Woodfill formed the statewide Mackinac Bridge Citizens Committee in 1949 to lobby for a new bridge authority, which the legislature created in 1950. A panel of three prominent engineers conducted a feasibility study and made recommendations to the bridge authority on the location, structure, and design of the bridge. The State Highway Department, which had just placed a $4.5 million ferryboat, Vacationland, into service at the straits in January 1952, remained hostile to the bridge plan. In April 1952, the Michigan legislature authorized the bridge authority to issue bonds for the project, choose an engineer, and proceed with construction. The authority selected David B. Steinman as the chief engineer in January 1953 and tried unsuccessfully to sell the bridge bonds in April 1953, but by the end of the year, the authority had sold the $99.8 million in revenue bonds needed to begin construction. View Allison’s photo bigger and see LOTS more in her Mackinac Island slideshow! Fort Michilimackinac was built by the French on the south shore of the Straits of Mackinac in approximately 1715. Previously, French presence in the Straits area was focused in what is now St. Ignace where Father Marquette established a Jesuit mission in 1671 and Fort de Baude was established around 1683. In 1701, Cadillac moved the French garrison from St. Ignace to Detroit, which led to the closing of the mission and considerably reduced French occupation in the area. Several years later, as the French sought to expand the fur trade, they built Fort Michilimackinac to re-establish a French presence in the Straits area. Fort Michilimackinac was a strategically located fortified trading post. The fort was not built primarily as a military facility but as a link in the French trade system, which extended from Montreal through the Great Lakes region and northwest to Lake Winnipeg and beyond. Overlooking the Straits of Mackinac connecting Lake Huron and Lake Michigan, the fort served as a supply post for French traders operating in the western Great Lakes region and as a primary stopping-off point between Montreal and the western country. Fort Michilimackinac was an island of French presence on the frontier from which the French carried out the fur trade, sought alliances with native peoples, and protected their interests against the colonial ambitions of other European nations. In 1761 the French relinquished Fort Michilimackinac to the British who had assumed control of Canada as a result of their victory in the French and Indian War. Under the British, the fort continued to serve as a major fur trade facility. The Ottawa and Chippewa in the Straits area, however, found British policies harsh compared to those of the French and they resented the British takeover. In 1763 as part of Pontiac’s Rebellion, a group of Chippewa staged a ball game outside the stockade to create a diversion and gain entrance to the post and then attacked and killed most of the British occupants. The use of Fort Michilimackinac came to an end in 1781 when the British abandoned the post and moved to Fort Mackinac on Mackinac Island. You can get more including visitor information at Colonial Michilimackinac and also check out this History Channel program on Pontiac’s Rebellion (the Michilimackinac story is about 20 minutes in). View Mark’s photo background big and see more in his Mackinac, Michigan slideshow. More from Mackinac on Michigan in Pictures! This classic lighthouse started life in 1998 as a Michigan Welcome Center travel icon at Monroe, Michigan. In 2004, the Monroe Welcome Center was being revamped and the lighthouse was put up for relocation. The City of St. Ignace was the lucky recipient and the structure was trucked north in five pieces. It stayed on the Chief Wawatam Dock for a time, awaiting the construction of its new platform. The red, white and green lighthouse was repainted in bright white with red accents. In June 2006, a crane reassembled the tower on its new site. Everything was in readiness, just waiting for U.S. Coast Guard certification. Wawatam Lighthouse takes its name from the late railroad ferry Chief Wawatam, which used this same dock from 1911 through the mid-1980s. When you visit the lighthouse, you will pass right by the Chief’s old lift gate. Wawatam Lighthouse’s beacon was first lit on August 20, 2006. Visible for more than 13 miles out over Lake Huron, it is now an official aid-to-navigation. The 250 millimeter Fresnel lens casts its light in a 152 degree arc. Though the lighthouse’s GPS location is 45-051-19.700 N by 084-42-09.000 W, it will most likely be easier for you to find it straight out east of McCann Street. The tower is 52 feet tall, but the Coast Guard looks at it in a different way. They rate it as 62 feet tall from the water. It is even lit in the winter to guide snowmobiles across the frozen lake. View Charles’ photo background big and see more in his slideshow. More Michigan lighthouses on Michigan in Pictures! With the bridge ready for traffic, but fearing inclement autumn weather at the Straits, officials decided to have an official “opening” on November 1, 1957, but an official “dedication” in late June of the following year. A friend found this large format color slide earlier this year and I scanned it at high resolution. It shows Governor G. Mennen “Soapy” Williams at the tollbooths on the St. Ignace end of the Mackinac Bridge on the day it opened, November 1, 1957. I have seen many photos of this day, but never one quite like this. Be sure to check this out big as the Mighty Mac to see the faces in the crowd and jump into Dave’s slideshow for more. Michigan in Pictures has lots more on the Mackinac Bridge and you can get a comprehensive look at the bridge on the 50 Year feature on the Mackinac Bridge at Absolute Michigan. Worry isn’t a word Nagler uses to talk about the upcoming distance swim, which is expected to take place Wednesday between Michigan’s Upper and Lower Peninsulas, on the west side of the mighty Mackinac Bridge. But she does have legitimate concerns, chiefly hypothermia from the cold water. Nagler will wear a lightweight wetsuit, of the sort tri-athletes wear, to combat that problem. Combined with dive boots, it should keep her warm enough. “The heavier wetsuits, like water skiers wear, make me too buoyant in the water,” she said. Nagler, who summered at her family’s cabin in Northport as a child, has been a life-long swimmer. She has several distance swims to her credit, both in the United States and England. But her goal to swim across Lake Michigan has the most meaning for her. You can read on for more and also check out Nagler’s crosslakemi.org where she discusses the preparation for the swim. I thought I would try and figure out how many people have swum the 4.1 mile distance across the Straits of Mackinac, but it appears that the answer is “a lot.” This feature in the St. Ignace News about a group of 5 who swam the Straits in 2011 has some great information about swimming the Straits, and notes that the Coast Guard receives about 10 special marine requests specifically for swimming the Straits. View ShelNf’s photo bigger and see more from the Straits in their slideshow.